Film buff alert. Icarus Films has just released an 84-minute bio-pic about Robert Flaherty, the "flawed genius" who is generally credited with being the father of the modern documentary film. Directed by Mac Dara O'Curraidbin for Irish TV, A BOATLOAD OF WILD IRISHMEN opens with excerpts from Flaherty's pioneering documentary Man of Aran, an unforgettable portrait of the hardy Irish fisherfolk scratching out a living on the island of Aran. The American-born Flaherty went there in 1934 and earned the respect and friendship of the islanders, who not only allowed him into their homes but risked their lives for him by taking to the sea in the midst of a tumultuous storm. The black-and-white footage of three men of Aran battling winds and waves to row back to shore in their puny wooden boat holds a special place in film history. Many critics have praised Flaherty for capturing such a dramatic and compelling event; others have criticized him for having staged things in order to make for a more commercial film. A BOATLOAD OF WILD IRISHMAN puts that last notion to rest. As Frances Flaherty (Robert's widow) says in a 1978 interview, the men of Aran volunteered to put out to sea, wanting to show the world just how tough and courageous they were. Flaherty ran into the same kind of criticism when he made his first documentary (in 1922), Nanook of the North, an intimate study of Canada's northernmost Inuits. 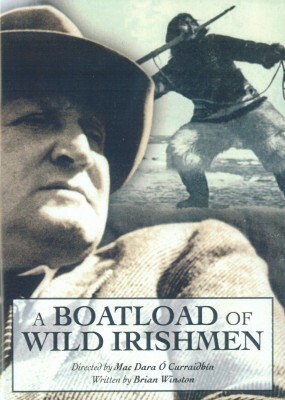 Charges of ethnographic falsification and exploitation of subjects were made, but as A BOATLAND OF WILD IRISHMEN shows convincingly, although Flaherty might have shaped the elements of his film into melodrama, he did not invent or distort any details of everyday life. Among the numerous talking heads featured in A BOATLOAD OF WILD IRISHMEN are Flaherty's granddaughter (the child of his Inuit mistress); Richard Leacock, cameraman on Flaherty's Louisiana Story; film scholar Sean Crosson; and Deirde Ni Chonghaile, a musician and folklorist from Aran.